It took me ages to find the venue for my interview. I made the mistake of walking to the venue on a hot summers day in my finest suit. When I arrived I was hot and sweaty. I made a focused effort to keep my arms down so that they would not see the sweat that had soaked through my shirt from my arm pits. I didn’t sweat it too much (re-read comment – ha! that was not intended). I had met two of the three interviewers via various networking in my graduate placement, so felt that gave me a bit more of a chance. I came across quite well – I impressed by giving a technical presentation, I answered their questions well and they loved my PowerPoint slides – they complemented that they were the best designed they had seen all day. The interview didn’t end there though. This was the first and only time I participated in a ‘group interview’ – this was intended to see how we all interacted with each other. It was also what I dreaded because I knew it was going to be my downfall. I knew it was my downfall because the world undervalues an introvert. To start with it went okay, I took small steps like not making a complete pig out of myself eating lunch. We had an exercise where we paired up with someone and had to learn five things about each other and repeat them pack to the class, I mean serious interview candidates. I always felt stronger in one-to-one situations because its always easy to balance the conversation and built a good rapport with the other person in the short space of time. Then we had the group task. I knew how this went I had seen the Apprentice enough – three types would emerge – the ‘annoying idiot who knows nothing’, the clever one who takes charge and those who you can’t remember up until Week 6 when you start realising that they are going to be a finalist. But the problem here was we didn’t have 6 weeks. And everyone in the room knew how this was going to go down – they had to be the leader. I knew I had to pull a bit of extrovert out of somewhere to succeed. So we were split into three groups – four in each team. And the challenge was to build the biggest tower out of paper straws. I have no idea why – maybe part of the job role was building towers. I didn’t seeit in the job description – I remember it involving organising events, and leading groups in training sessions, but well… towers it was. Once the task started it descended into chaos. It was loud and rowdy in the room and in my team two of them went all out, leaning more toward ‘annoying idiot who knows nothing.’ So as they tried their best to talk over each other I slumped back and knew I would not rise to the occasion this time. 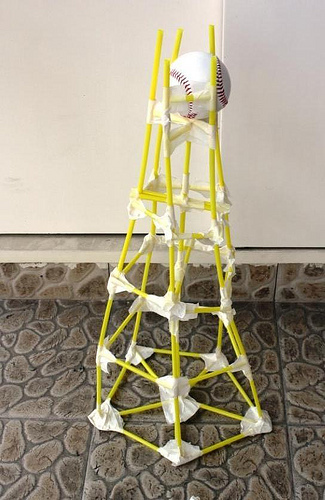 The third person was trying to chip in, this time by grabbing the straws and tape and getting a tower thrown together. The other two realised what was going on and started shouting directions to the creator. Maybe I can get this job if they see my other skills. I thought (wrongly), so I quickly made an assessment with the materials before they were quickly thrown together planning on how to made it sturdy but make it as high as possible. Maybe I could show them the sketch and change their minds while there was still time. I was going for a triangle design, but by the time I had finished they had put a massive contraption together…. And it looked nothing like this. As it was presented by the loudest loud mouth it was actually kind of satisfying watching it fall apart as she spoke (even with the knowledge that I knew I did not have the job). Of course I didn’t get the job – they wanted me to lead in ways I couldn’t – not in that situation and for years it made me hate being an introvert. It falsely made me believe that being the loudest and always having an opinion was the way to get ahead. It was only when I got appreciation for my introvert skills – being able to plan, think, be analytical that I began to love who I was again. It also made me realise that a good leader isn’t necessarily the good presenter but the one who has the vision. And sometimes the person with the vision is the type to sit back, be quiet and draw out that stupid, sturdy, straw tower. Years later I would see the organisation I had attempted to join in the news for the wrong reason. They had banned clapping at their conferences and encouraged the use of ‘jazz hands’ by the audience instead. I laughed – to think I wanted to work with such a bunch of pussies. Jazz hands?! Seriously!!!? Oh my God. That’s absolutely silly… Wait, I get it! They don’t want on person to get more applause than someone else, maybe? What a bunch of ultramaroons! You couldn’t have put it more accurately.